There’s no shortage of GPS fitness-tracking apps. Now, however, Runnit for iPhone wants to reward you with discounts, free products and “exclusive content” every time you pound the pavement. 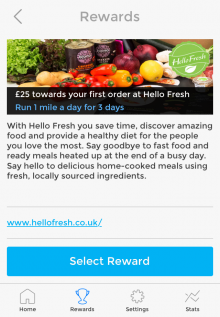 Though the app is available to download globally, the offers are UK-centric for now – but a US launch is on the cards for early 2014. To set yourself a goal, you must choose a reward from the store. 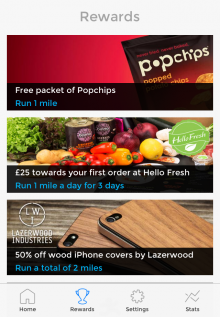 The options will grow over time, but for now there are 15 partners on board, and includes things like 50% off wooden iPhone covers at Lazerwood, and £25 towards your first order at Hello Fresh. 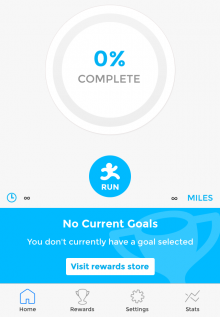 Each reward has a goal attached to it – for example ‘Run 1 mile a day for 3 days’. 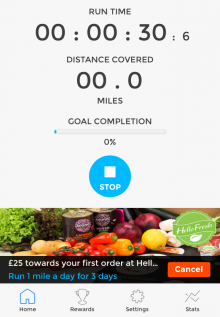 The app then tracks your progress much in the same way as a traditional app such as RunKeeper or Strava. 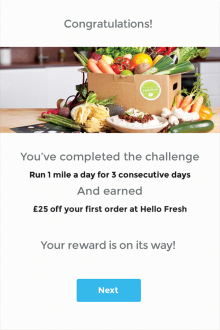 As you progress towards your goal, you’re given a progress report, and on completion you’ll receive an email with details of how to redeem your reward. The concept is pretty straight-forward, though isn’t entirely new. You may remember GymPact launched last year, with one key mission in mind – to help you keep your fitness promises. It lets you earn money for completing your workouts as planned – which is paid for by those who missed their targets. Crucially though, GymPact has inked deals with third-party services such as RunKeeper, JawBone UP and Fitbit – in my view this is vital for such services to properly gain traction. As I noted with Fuel My Run, an iPhone app that reminds you to fuel-up during endurance events such as marathons, often such tools are better placed as features of more fully-functioned fitness services rather than as a standalone app. Runnit is a great idea for sure, but I won’t be ditching Runtastic any day soon given that I want things like maps, splits, music, routes and more. 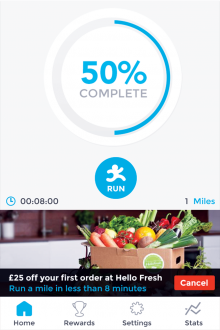 But if apps such as Runtastic could integrate something like Runnit, that would be a great news. That all said, perhaps Runnit has a different target demographic – those that are looking for motivation to get out and run, rather than those that are already out running. And as it brings more partners on board with more discounts and offers, it could become something really great.